Have you ever stumbled across a fantastic fabric find at an estate sale but hesitated to bring it home due to the way it smelled? Or perhaps that vintage fabric has a few unsightly stains that you have no clue how to get out? Well, as a seasoned estate sale hunter, I have a few tricks up my sleeve to help bring these treasures back to life! Vintage fabrics come in all shapes and sizes. 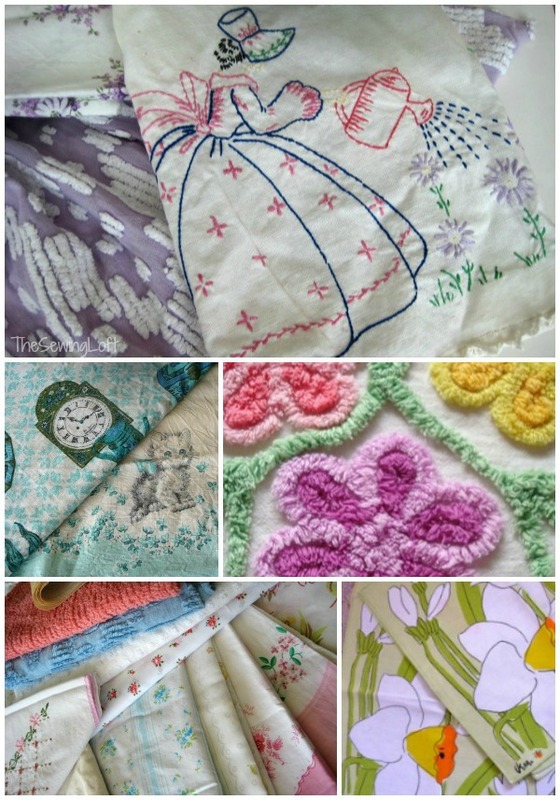 A few of my favorites are table lines, chenille bedspreads, handkerchiefs and bed sheets. I just love the pattern variety and the hand embroidery work. But the real question is how do we clean these hidden jewels. It’s actually really easy and just requires patience. First things first- do they pass the smell test? Whether they have been stored in an old cedar chest or a damp basement, I’m sure they smell funky! To help battle this, I like to I like to air out my goodies for a day or two before cleaning. That’s right, just unfolding them and airing them out can do a world of good in the smell department. Next comes the cleaning. Washing and cleaning vintage fabric can be tricky. There are many ways to clean your linens and remove stains on the internet but this is the method I like to use. In a large plastic tub, create a mild temperature bath of white vinegar, water and Twenty Mule Team Borax. (Sometimes, I even add a drop of Ivory dish soap.) Let fabric soak for 10 to 15 mins, then lightly wash fabrics by hand. Be sure not to agitate the fibers too vigorously as sometimes this can cause tearing. Gently ring out water. Gentle is the key word here! Do not twist and pull. If needed, place items between dry towels and roll out excess moisture. Finally, its dry time. For this mother nature is your friend. I like to place my finds outside on the grass away from direct sunlight to dry. I want to just stress here that I do not hang them on a clothes line, back of a chair or anything for that matter. Sometimes the weight of the fabric is too much for these vintage babies. By laying them down on the grass you are allowing the air to circulate all around and reducing the stress on the fibers. Repeat the process as needed for heavily stained areas. Sometimes when an item is heavily stained I will place it to dry in direct sunlight. You need to be careful on this one. Yes, the sun will fade the stain but it will also wash out and fade the pattern. So, use this method as a last resort to save your vintage fabric. These simple cleaning methods are a sure-fire way to help bring your vintage beauties back to life. ps-Did you see that little handkerchief dress? That is one of my many vintage hankies. I created that dress with this easy to follow origami video tutorial and some vintage velvet trim. I’m still not sure what I am going to create with it but I think I’m off to a great start. 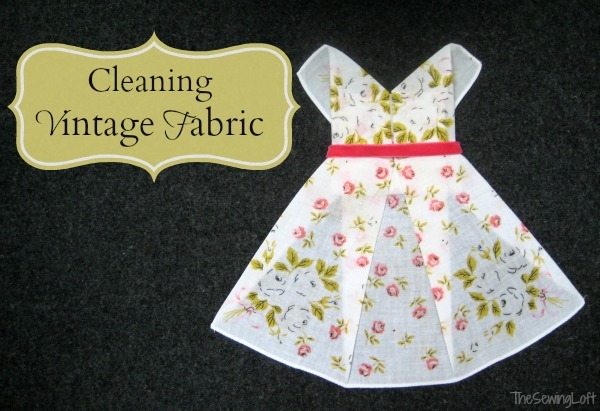 Thanks for the great tips on restoring old vintage fabrics! It is always good to have a reminder about what works! It would be so awesome to gain confidence when sewing knit fabric! I love vintage embroidery and the folded hankie dress is adorable! I love vintage fabrics. With the book, perhaps I could find a way to repurpose some of the ones I have! Then they could be seen again. I love the vintage fabrics tips. This is the first thing I look for at thrift shops and “trash to treasures” shops. Unfortunately for me, everyone else has discovered the wonderful fabric too! First of all I don’t know how to WEBSITE. Maybe you could explain in your next update. I absolutely love the abundance of information you have in all of your updates. I look forward to emails from you each week. I am disabled, but am always look forward to craft & other ideas for projects from you. Fresh banana chocolate chip muffin and tea sounds like a fantastic way to start the morning Shannon! Thanks so much for making my day with your comment! I would love to be the winner of Nancy’s book. I have some and everyone is a jewel. She has been an inspiration for many years. I love you tips for vintage fabrics. Great tips! Love the little “hankie” dress–adorable!! I really haven’t done much sewing with knits, would love to win Nancy’s book and patterns–thank you!! I have never sewn with knits but would like to try. I’d like to win the book and patterns! Your tips for vintage items came in very handy. I just got some doilies from the 1930’s I won on ebay and boy do they smell. I am making a lampshade out of them for a guest bedroom. Now I know how to treat them. Thanks. Great tips regarding the vintage fabrics. Thanks. Thanks also for the chance to win in the giveaway. Thank you for the opportunity to win the book and patterns. I have never worked with knits but I have always wanted to> I guess I am just a little bit afraid, and this might be the nudge I need to try. Thanks for sharing your blog and have a great day. Would love to learn how to sew with knits. I think Nancy’s book and patterns might just do that! Thanks for the chance to win. Will you post the winner, or just contact her/him? Great information. We have a link party called Wednesdays Adorned From Above Blog Hop and would love to have you share this and any other posts with everyone. It runs from Tuesday night through midnight Sunday. Here is the link to the party. Try Biz to soak out stains. Recently learned that a quilt curator uses it. I thought vineager was used to set colors? I used to make heirloom style clothing for my grandchildren. They are no in their 20s and 30s and having children of their own. Often I find that the garments weren’t stored as well as they could have been. They are yellowed, and sometimes have mystery stains on them. With very few exceptions, I have been able to bring them back to new looking by soaking in a bath of Oxy-Clean and Era. in medium hot water. Keep checking and when the staining is gone, Rinse well and roll in towels to damp dry. I then lay them flat on white towels to finish drying. It’s very rewarding to now see my great grandchildren wearing the clothes. Heirloom pieces are the best Karen! But you are right, they do not always age well. Thanks so much for sharing your process! That would be SO pretty Stacy! I originally thought I would make it into a card but it was too big. So for now, it is just sitting in the office on a pile of fabric. I might need to pull out a picture frame. Thanks for the tip! Years ago, at a luncheon with Martha Pullen, she told us how she processes old, stained, cottons. In a large tub, with enough water to cover the article(s) add one cup of oxygen bleach, i.e. Biz, Clorox Two, and allow the piece(s) to soak. Forget about it for a day or so, and then gently squeeze the water/bleach mixture from the article, rinse in clear water and lay out to dry. This type of bleach will not fade the color from old embroidered linens and heirloom pieces will look lovely. As I said, it was years ago and I have used this method over and over again. My granddaughter has worn some 100-year-old, hand-sewn blouses on stage that I have treated in this manner, She is quite fond of vintage clothing and she is still small enough to wear some of the pieces that I have collected. Thank you so much for sharing. I love hearing stories like this. Will your cleaning technique work on a vintage lace tablecloth ? Was white now is brownish and smells bad . Was my grandmothers would love to restore it to its former beauty. I would give it a go Judy. It may need a few washings but this method has always worked well for me. I collect old lace, which is usually cotton, and have restored brown to white with the following; first, soak in plain cold water for several hours. Drain the brown water off, and if it is still brown, repeat. When you no longer have discolored water to drain, spray with Z’out–available in the laundry soap section of your major supermarket–and then gently wash as usual. I frequently put the item, depending on its size, into a mesh bag and machine wash on gentle. For lace I dry flat on absorbent towels.